A Royal Road to quantum physics? It is said that, when Ptolemy asked Euclid to quickly explain him geometry, Euclid told the King that there was no ‘Royal Road’ to it, by which he meant it’s just difficult and takes a lot of time to understand. Physicists will tell you the same about quantum physics. So, I know that, at this point, I should just study Feynman’s third Lectures Volume and shut up for a while. However, before I get lost while playing with state vectors, S-matrices, eigenfunctions, eigenvalues and what have you, I’ll try that Royal Road anyway, building on my previous digression on Hamiltonian mechanics. 1. We write down a function referred to as the Lagrangian function. The function is L = T – V with T and V the kinetic and potential energy respectively. T has to be expressed as a function of velocity (v) and V has to be expressed as a function of position (x). You’ll say: of course! However, it is an important point to note, otherwise the following step doesn’t make sense. So we take the equations for kinetic and potential energy and combine them to form a function L = L(x, v). It should be obvious now why I stressed we should write L as a function of velocity and position, i.e. as L = L(x, v). Otherwise those partial derivatives don’t make sense. As to where this equation comes from, don’t worry about it: I did not explain why this works. I didn’t do that here, and I also didn’t do it in my previous post. What we’re doing here is just explaining how it goes, not why. 3. If we’ve done everything right, we should get a second-order differential equation which, as mentioned above, we should then solve for x(t). That’s what ‘solving’ a differential equation is about: find a functional form that satisfies the equation. Let’s now look at the Hamiltonian approach. 1. We write down a function referred to as the Hamiltonian function. It looks similar to the Lagrangian, except that we sum kinetic and potential energy, and that T has to be expressed as a function of the momentum p. So we have a function H = T + V = H(x, p). 2. We then calculate the so-called Hamiltonian equations, which is a set of two equations, rather than just one equation. [We have two for the one-dimensional situation that we are modeling here: it’s a different story (i.e. we will have more equations) if we’d have more degrees of freedom of course.] It’s the same as in the Lagrangian approach: it’s just a matter of calculating partial derivatives, and insert them in the equations below. Again, note that I am not explaining why this Hamiltonian hocus-pocus actually works. I am just saying how it works. 3. If we’ve done everything right, we should get two first-order differential equations which we should then solve for x(t) and p(t). Now, solving a set of equations may or may not be easy, depending on your point of view. If you wonder how it’s done, there’s excellent stuff on the Web that will show you how (such as, for instance, Paul’s Online Math Notes). Now, I mentioned in my previous post that the Hamiltonian approach to modeling mechanics is very similar to the approach that’s used in quantum mechanics and that it’s therefore the preferred approach in physics. I also mentioned that, in classical physics, position and momentum are also conjugate variables, and I also showed how we can calculate the momentum as a conjugate variable from the Lagrangian: p = ∂L/∂v. However, I did not dwell on what conjugate variables actually are in classical mechanics. I won’t do that here either. Just accept that conjugate variables, in classical mechanics, are also defined as pairs of variables. They’re not related through some uncertainty relation, like in quantum physics, but they’re related because they can both be obtained as the derivatives of a function which I haven’t introduced as yet. That function is referred to as the action, but… Well… Let’s resist the temptation to digress any further here. If you really want to know what action is–in physics, that is… 🙂 Well… Google it, I’d say. What you should take home from this digression is that position and momentum are also conjugate variables in classical mechanics. As you know by now (I wrote at least a dozen posts on this), the concept of position and momentum in quantum mechanics is very different from that in classical physics: we do not have x(t) and p(t) functions which give a unique, precise and unambiguous value for x and p when we assign a value to the time variable and plug it in. No. What we have in quantum physics is some weird wave function, denoted by the Greek letters φ (phi) or ψ (psi) or, using Greek capitals, Φ and Ψ. To be more specific, the psi usually denotes the wave function in the so-called position space (so we write ψ = ψ(x)), and the phi will usually denote the wave function in the so-called momentum space (so we write φ = φ(p)). That sounds more complicated than it is, obviously, but I just wanted to respect terminology here. Finally, note that the ψ(x) and φ(p) wave functions are related through the Uncertainty Principle: they’re conjugate variables, and we have this ΔxΔp = ħ/2 equation, in which the Δ is some standard deviation from some mean value. I should not go into more detail here: you know that by now, don’t you? The A and B situations represent a classical oscillator: we know exactly where the red ball is at any point in time. The C to H situations give us a complex-valued amplitude, with the blue oscillation as the real part, and the pink oscillation as the imaginary part. So we have such wave function both for x and p. Note that the animation above suggests we’re only looking at the wave function for x but–trust me–we have a similar one for p, and they’re related indeed. [To see how exactly, I’d advise you to go through the proof of the so-called Kennard inequality.] So… What do we do with that? Don’t panic. It’s just an integral. Look at it. ψ* is just the complex conjugate (i.e. a – ib if ψ = a + ib) and you will (or should) remember that the product of a complex number with its (complex) conjugate gives us the square of its absolute value: ψ*ψ = |ψ(x)|2. What about that x? Can we just insert that there, in-between ψ* and ψ ? Good question. The answer is: yes, of course! That x is just some real number and we can put it anywhere. However, it’s still a good question because, while multiplication of complex numbers is commutative (hence, z1z2 = z2z1), the order of our operators – which we will introduce soon – can often not be changed without consequences, so it is something to note. So… You’ve surely heard about the position and momentum operators already. Is that, then, what it is? Doing some integral on some function to get an expected value? Well… No. But there’s a relation. However, let me first make a remark on notation, because that can be quite confusing. The position operator is usually written with a hat on top of the variable – like ẑ – but so I don’t find a hat with every letter with the editor tool for this blog and, hence, I’ll use a bold letter x and p to denote the operator. Don’t confuse it with me using a bold letter for vectors though ! Now, back to the story. Let’s first give an example of an operator you’re already familiar with in order to understand what an operator actually is. To put it simply: an operator is an instruction to do something with a function. For example: ∂/∂t is an instruction to differentiate some function with regard to the variable t (which usually stands for time). The ∂/∂t operator is obviously referred to as a differentiation operator. When we put a function behind, e.g. f(x, t), we get ∂f(x, t)/∂t, which is just another function in x and t.
So we have the same here: x in itself is just an instruction: you need to put a function behind in order to get some result. So you’ll see it as xψ. In fact, it would be useful to use brackets probably, like x[ψ], especially because I can’t put those hats on the letters here, but I’ll stick to the usual notation, which does not use brackets. What’s this? Don’t worry about it. I know: that looks like a very different animal than that x operator. I’ll explain later. Just note, for the moment, that the momentum operator (also) involves a (partial) derivative and, hence, we refer to it as a differential operator (as opposed to differentiation operator). The instruction p = –iħ∂/∂x basically means: differentiate the function with regard to x and multiply with iħ (i.e. the product of Planck’s constant and the imaginary unit i). Nothing wrong with that. Just calculate a derivative and multiply with a tiny imaginary (complex) number. Now, back to the position operator x. As you can see, that’s a very simple operator–much simpler than the momentum operator in any case. The position operator applied to ψ yields, quite simply, the xψ(x) factor in the integrand above. So we just get a new function xψ(x) when we apply x to ψ, of which the values are simply the product of x and ψ(x). Hence, we write xψ = xψ. Back to the momentum operator. Where does that come from? That story is not so simple. [Of course not. It can’t be. Just look at it.] Because we have to avoid talking about eigenvalues and all that, my approach to the explanation will be quite intuitive. [As for ‘my’ approach, let me note that it’s basically the approach as used in the Wikipedia article on it. :-)] Just stay with me for a while here. 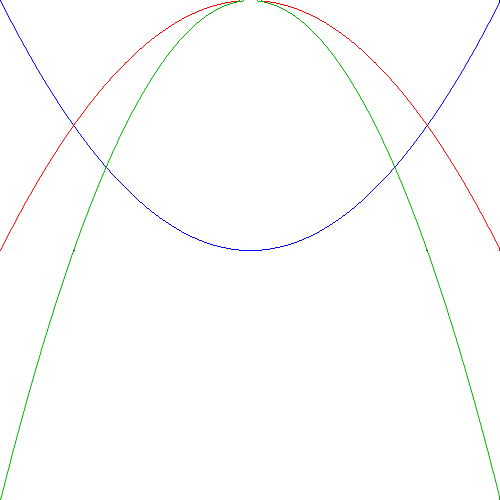 Let’s assume ψ is given by ψ = ei(kx–ωt). So that’s a nice periodic function, albeit complex-valued. Now, we know that functional form doesn’t make all that much sense because it corresponds to the particle being everywhere, because the square of its absolute value is some constant. In fact, we know it doesn’t even respect the normalization condition: all probabilities have to add up to 1. However, that being said, we also know that we can superimpose an infinite number of such waves (all with different k and ω) to get a more localized wave train, and then re-normalize the result to make sure the normalization condition is met. Hence, let’s just go along with this idealized example and see where it leads. [If you’re confused about the –i, remember that i–1 = 1/i = –i.] So… We’ve got pψ on the right-hand side now. So… Well… That’s like xψ, isn’t it? Yes. 🙂 If we define the momentum operator as p = (–i/ħ)(∂/∂x), then we get pψ = pψ. So that’s the same thing as for the position operator. It’s just that p is… Well… A more complex operator, as it has that –i/ħ factor in it. And, yes, of course it also involves an instruction to differentiate, which also sets it apart from the position operator, which is just an instruction to multiply the function with its argument. V = V, so that’s just an instruction to multiply a function with V = V(x, t). That’s easy enough because that’s just like the position vector. T = p·p/2m = p2/2m. So. Yes. That’s the famous Hamiltonian operator. Well… I am not writing this post just to give some definitions of the type of operators that are used in quantum mechanics and then just do obvious stuff by writing it all out. No. I am writing this post to illustrate how things work. OK. So how does it work then? If you’re still with me, you’ll immediately wonder about that μ. Well… Don’t. It’s the mass really, but the so-called reduced mass. Don’t worry about it. Just google it if you want to know more about this concept of a ‘reduced’ mass: it’s a fine point which doesn’t matter here really. The point is the grand result. But… So… What is the grand result? What are we looking at here? Well… Just as I said above: that Schrödinger equation is a differential equation, just like those equations we got when applying the Lagrangian and Hamiltonian approach to modeling a dynamic system in classical mechanics, and, hence, just like what we (were supposed to) do there, we have to solve it. 🙂 Of course, it looks much more daunting than our Lagrangian or Hamiltonian differential equations, because we’ve got complex-valued functions here, and you’re probably scared of that iħ factor too. But you shouldn’t be. When everything is said and done, we’ve got a differential equation here that we need to solve for ψ. In other words, we need to find functional forms for ψ that satisfy the above equation. That’s it. Period. As an economist, I thought I knew a thing or two about optimization. Indeed, when everything is said and done, optimization is supposed to an economist’s forte, isn’t it? 🙂 Hence, I thought I sort of understood what a Lagrangian would represent in physics, and I also thought I sort of intuitively understood why and how it could be used it to model the behavior of a dynamic system. In short, I thought that Lagrangian mechanics would be all about optimizing something subject to some constraints. Just like in economics, right? […] Well… When checking it out, I found that the answer is: yes, and no. And, frankly, the honest answer is more no than yes. 🙂 Economists (like me), and all social scientists (I’d think), learn only about one particular type of Lagrangian equations: the so-called Lagrange equations of the first kind. This approach models constraints as equations that are to be incorporated in an objective function (which is also referred to as a Lagrangian–and that’s where the confusion starts because it’s different from the Lagrangian that’s used in physics, which I’ll introduce below) using so-called Lagrange multipliers. If you’re an economist, you’ll surely remember it: it’s a problem written as “maximize f(x, y) subject to g(x, y) = c”, and we solve it by finding the so-called stationary points (i.e. the points for which the derivative is zero) of the (Lagrangian) objective function f(x, y) + λ[g(x, y) – c]. Generalized coordinates? Don’t worry about it: while generalized coordinates are defined formally as “parameters that describe the configuration of the system relative to some reference configuration”, they are, in practice, those coordinates that make the problem easy to solve. For example, for a particle (or point) that moves on a circle, we’d not use the Cartesian coordinates x and y but just the angle that locates the particles (or point). That simplifies matters because then we only need to find one variable. In practice, the number of parameters (i.e. the number of generalized coordinates) will be defined by the number of degrees of freedom of the system, and we know what that means: it’s the number of independent directions in which the particle (or point) can move. Now, those independent directions may or may not include the x, y and z directions (they may actually exclude one of those), and they also may or may not include rotational and/or vibratory movements. We went over that when discussing kinetic gas theory, so I won’t say more about that here. So… OK… That was my first surprise: the physicist’s Lagrangian is different from the social scientist’s Lagrangian. And then we have good old Newtonian mechanics as well, obviously. In case you wonder what that is: it’s the modeling approach that we’ve been using all along. 🙂 But I’ll remind you of what it is in a moment: it amounts to making sense of some situation by using Newton’s laws of motion only, rather than a more sophisticated mathematical argument using more abstract concepts, such as energy, or action. Introducing Lagrangian and Hamiltonian mechanics is quite confusing because the functions that are involved (i.e. the so-called Lagrangian and Hamiltonian functions) look very similar: we write the Lagrangian as the difference between the kinetic and potential energy of a system (L = T – V), while the Hamiltonian is the sum of both (H = T + V). Now, I could make this post very simple and just ask you to note that both approaches are basically ‘equivalent’ (in the sense that they lead to the same solutions, i.e. the same equations of motion expressed as a function of time) and that a choice between them is just a matter of preference–like choosing between an English versus a continental breakfast. 🙂 Of course, an English breakfast has usually some extra bacon, or a sausage, so you get more but… Well… Not necessarily something better. 🙂 So that would be the end of this digression then, and I should be done. However, I must assume you’re a curious person, just like me, and, hence, you’ll say that, while being ‘equivalent’, they’re obviously not the same. So how do the two approaches differ exactly? Let’s try to get a somewhat intuitive understanding of it all by taking, once again, the example of a simple harmonic oscillator, as depicted below. It could be a mass on a spring. In fact, our example will, in fact, be that of an oscillating mass on a spring. Let’s also assume there’s no damping, because that makes the analysis soooooooo much easier. If you wonder why… Well… I can’t digress on that here again: just note, from that differential equation, that we apparently need a function x(t) that yields itself when differentiated twice. So that must be some sinusoidal function, like sine or cosine, because these do that. […] OK… Sorry, but I must move on. As for the new ‘variables’ (A, ω and α), A depends on the initial condition and is the (maximum) amplitude of the motion. We also already know from previous posts (or, more likely, because you already know a lot about physics) that A is related to the energy of the system. To be precise: the energy of the system is proportional to the square of the amplitude: E ∝ A2. As for ω, the angular frequency, that’s determined by the spring itself and the oscillating mass on it: ω = (k/m)1/2 = 2π/T = 2πf (with T the period, and f the frequency expressed in oscillations per second, as opposed to the angular frequency, which is the frequency expressed in radians per second). Finally, I should note that α is just a phase shift which depends on how we define our t = 0 point: if x(t) is zero at t = 0, then that cosine function should be zero and then α will be equal to ±π/2. OK. That’s clear enough. What about the ‘operational currency of the universe’, i.e. the energy of the oscillator? Well… I told you already/ We don’t need the energy concept here to find the equation of motion. In fact, that’s what distinguishes this ‘Newtonian’ approach from the Lagrangian and Hamiltonian approach. But… Now that we’re at it, and we have to move to a discussion of these two animals (I mean the Lagrangian and Hamiltonian), let’s go for it. We have kinetic versus potential energy. Kinetic energy (T) is what it always is. It depends on the velocity and the mass: K.E. = T = mv2/2 = m(dx/dt)2/2 = p2/2m. Huh? What’s this expression with p in it? […] It’s momentum: p = mv. Just check it: it’s an alternative formula for T really. Nothing more, nothing less. I am just noting it here because it will pop up again in our discussion of the Hamiltonian modeling approach. But that’s for later. Onwards! = (1/2)kA2[sin2(ωt + α) + cos2(ωt + α)] = kA2/2. The point to note is that this Hamiltonian function H = T + V is just a constant, not only for this particular case (an oscillation without damping), but in all cases where H represents the total energy of a (closed) system. The red curve represents kinetic energy (T) as a function of the displacement x: T is zero at the turning points, and reaches a maximum at the x = 0 point. The blue curve is potential energy (V): unlike T, V reaches a maximum at the turning points, and is zero at the x = 0 point. In short, it’s the mirror image of the red curve. The Lagrangian is the green graph: L = T – V. Hence, L reaches a minimum at the turning points, and a maximum at the x = 0 point. OK. Now that we have an idea of what the Lagrangian and Hamiltonian functions are (it’s probably worth noting also that we do not have a ‘Newtonian function’ of some sort), let us now show how these ‘functions’ are used to solve the problem. What problem? Well… We need to find some equation for the motion, remember? [I find that, in physics, I often have to remind myself of what the problem actually is. Do you feel the same? 🙂 ] So let’s go for it. As this post should not turn into a chapter of some math book, I’ll just describe the how, i.e. I’ll just list the steps one should take to model and then solve the problem, and illustrate how it goes for the oscillator above. Hence, I will not try to explain why this approach gives the correct answer (i.e. the equation(s) of motion). So if you want to know why rather than how, then just check it out on the Web: there’s plenty of nice stuff on math out there. Compute (i.e. write down) the Lagrangian function L = T – V. Hmm? How do we do that? There’s more than one way to express T and V, isn’t it? Right you are! So let me clarify: in the Lagrangian approach, we should express T as a function of velocity (v) and V as a function of position (x), so your Lagrangian should be L = L(x, v). Indeed, if you don’t pick the right variables, you’ll get nowhere. So, in our example, we have L = mv2/2 – kx2/2. Write down (‘compute’ sounds awkward, doesn’t it?) Lagrange’s equation: d(∂L/∂v)/dt = ∂L/∂x. […] Yep. That’s it. Why? Well… I told you I wouldn’t tell you why. I am just showing the how here. This is Lagrange’s equation and so you should take it for granted and get on with it. 🙂 In our example: d(∂L/∂v)/dt = d(mv)/dt = –k(dx/dt) = ∂L/∂x = – kx. We can also write this as m(dv/dt) = m(d2x/dt2) = –kx. Finally, solve the resulting differential equation. […] ?! Well… Yes. […] Of course, we’ve done that already. It’s the same differential equation as the one we found in our ‘Newtonian approach’, i.e. the equation we found by combining Hooke’s and Newton’s laws. So the general solution is x(t) = Acos(ωt + α), as we already noted above. So, yes, we’re solving the same differential equation here. So you’ll wonder what’s the difference then between Newtonian and Lagrangian mechanics? Yes, you’re right: we’re indeed solving the same second-order differential equation here. Exactly. Fortunately, I’d say, because we don’t want any other equation(s) of motion because we’re talking the same system. The point is: we got that differential equation using an entirely different procedure, which I actually didn’t explain at all: I just said to compute this and then that and… – Surprise, surprise! – we got the same differential equation in the end. 🙂 So, yes, the Newtonian and Lagrangian approach to modeling a dynamic system yield the same equations, but the Lagrangian method is much more (very much more, I should say) convenient when we’re dealing with lots of moving bits and if there’s more directions (i.e. degrees of freedom) in which they can move. In short, Lagrange could solve a problem more rapidly than Newton with his modeling approach and so that’s why his approach won out. 🙂 In fact, you’ll usually see the spatial variables noted as qj. In this notation, j = 1, 2,… n, and n is the number of degrees of freedom, i.e. the directions in which the various particles can move. And then, of course, you’ll usually see a second subscript i = 1, 2,… m to keep track of every qj for each and every particle in the system, so we’ll have n×m qij‘s in our model and so, yes, good to stick to Lagrange in that case. OK. You get that, I assume. Let’s move on to Hamiltonian mechanics now. The first step is very similar as the one above. In fact, it’s exactly the same: write T and V as a function of velocity (v) and position (x) respectively and construct the Lagrangian. So, once again, we have L = L(x, v). In our example: L(x, v) = mv2/2 – kx2/2. The second step, however, is different. Here, the theory becomes more abstract, as the Hamiltonian approach does not only keep track of the position but also of the momentum of the particles in a system. Position (x) and momentum (p) are so-called canonical variables in Hamiltonian mechanics, and the relation with Lagrangian mechanics is the following: p = ∂L/∂v. Huh? Yeah. Again, don’t worry about the why. Just check it for our example: ∂(mv2/2 – kx2/2)/∂v = 2mv/2 = mv. So, yes, it seems to work. Please note, once again, how we treat x and v as independent variables here, as is evident from the use of the symbol for partial derivatives. Let me get back to the lesson, however. The second step is: calculate the conjugate variables. In more familiar wording: compute the momenta. The third step is: write down (or ‘build’ as you’ll see it, but I find that wording strange too) the Hamiltonian function H = T + V. We’ve got the same problem here as the one I mentioned with the Lagrangian: there’s more than one way to express T and V. Hence, we need some more guidance. Right you are! When writing your Hamiltonian, you need to make sure you express the kinetic energy as a function of the conjugate variable, i.e. as a function of momentum, rather than velocity. So we have H = H(x, p), not H = H(x, v)! In our example, we have H = T + V = p2/2m + kx2/2. You’ll say: what the heck? Why are you making things so complicated? Indeed, what am I doing here? Am I making things needlessly complicated? The answer is the usual one: yes, and no. Yes. If we’d want to do stuff in the classical world only, the answer seems to be: yes! In that case, the Lagrangian approach will do and may actually seem much easier, because we don’t have a set of equations to solve. And why would we need to keep track of p(t)? We’re only interested in the equation(s) of motion, aren’t we? Well… That’s why the answer to your question is also: no! In classical mechanics, we’re usually only interested in position, but in quantum mechanics that concept of conjugate variables (like x and p indeed) becomes much more important, and we will want to find the equations for both. So… Yes. That means a set of differential equations (one for each variable (x and p) in the example above) rather than just one. In short, the real answer to your question in regard to the complexity of the Hamiltonian modeling approach is the following: because the more abstract Hamiltonian approach to mechanics is very similar to the mathematics used in quantum mechanics, we will want to study it, because a good understanding of Hamiltonian mechanics will help us to understand the math involved in quantum mechanics. And so that’s the reason why physicists prefer it to the Lagrangian approach. […] Really? […] Well… At least that’s what I know about it from googling stuff here and there. Of course, another reason for physicists to prefer the Hamiltonian approach may well that they think social science (like economics) isn’t real science. Hence, we – social scientists – would surely expect them to develop approaches that are much more intricate and abstract than the ones that are being used by us, wouldn’t we? Post scriptum 2 (dated 13 September 2017): I started a blog on the Exercises on Feynman’s Lectures, and the posts on the exercises on Chapter 4 have a lot more detail, and basically give you all the math you’ll ever want on this. Just click the link. However, let me warn you: the math is not easy. Not at all, really.